I will preface this post by saying that the photos are pretty lousy--I don't have a lot of daylight to work in during the week. And by "a lot," I mean "any"--the sun is barely up by the time I leave for work, and has already gone to bed by the time I leave the office, let alone get home. I used a bunch of obnoxious Flickr "filters" to make them look marginally more acceptable. 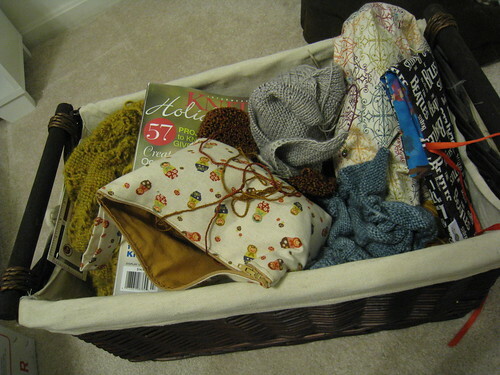 I'm still busy organizing, inspired by WEBS' new year organization series, and yesterday I tackled my WIPs. I found 3 baskets full of them. Clearly, I had to take action. This included 2 fairly major frogging decisions. But can't stand the yarn. I picked up a bunch of the yarn actually called for in the pattern, Cascade Pastaza, on sale last year, and was excited to work with it because it sounds delightful: 50% wool, 50% llama. In reality, it's a hairy mess. It sheds like crazy and just isn't fun to work with. 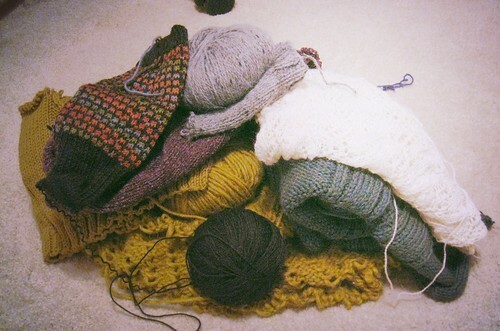 I'll definitely be tackling this blanket with another yarn sometime in the (hopefully near) future. 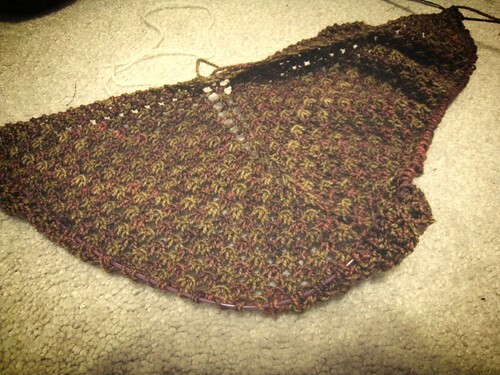 And secondly, my Adhara Shawl. 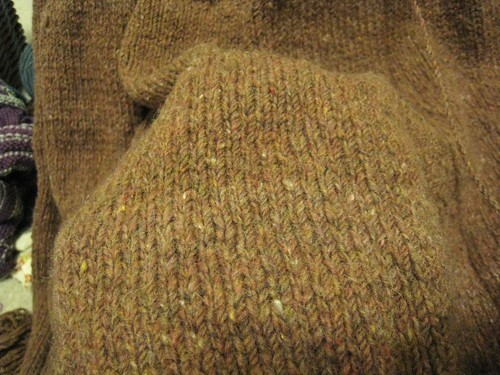 Unfortunately, the color combo I chose--a red/brown and yellow--just wasn't working out the way I'd hoped. I thought it would be autumn-y and warm, but instead it's just dull. I'll be picking a new color combo for this project, probably light and dark shades of a single color, as used in the original, and starting over again at some point. 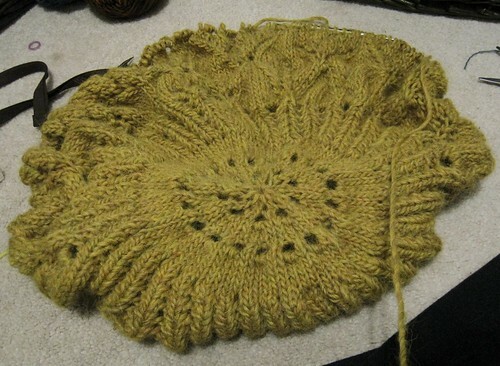 I started it with a partially used skein, leftover from my Wildflower Cardigan. 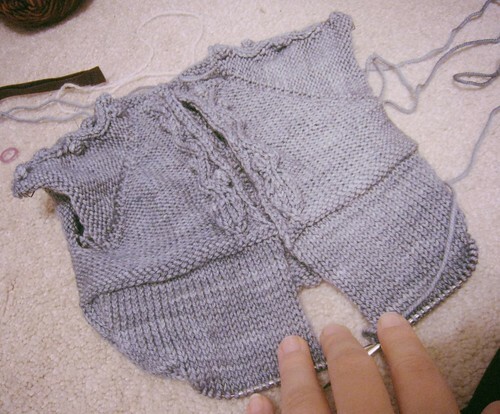 But in order to finish it, I'll have to start a second new skein, and I'm not sure it's worth it--who is this sweater even for? It's too girlie for the wee Peruanito. I don't know if it's obvious in the photo, but there's a distinct color difference between the first and second skeins of yarn. I'm not sure I can live with it. 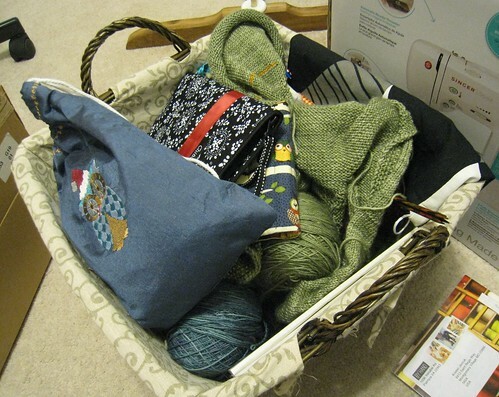 These two question marks led me to the decision to institute a Two WIP Basket System: one basket for "short term" WIPs, and one for "long term." Long term WIPs are those I'm not actively working on. They could be for a different season, awaiting an epiphany regarding a mistake I've made so that I can move forward, or, like the last two projects, could be "undecided." I hope to revisit these projects each year to further evaluate. 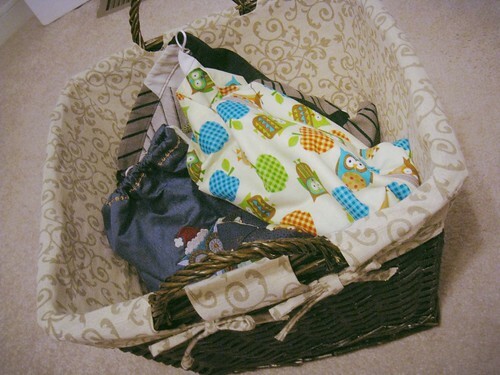 To make the magical jump to the short term basket, a project must be in active rotation, and must have a project bag! 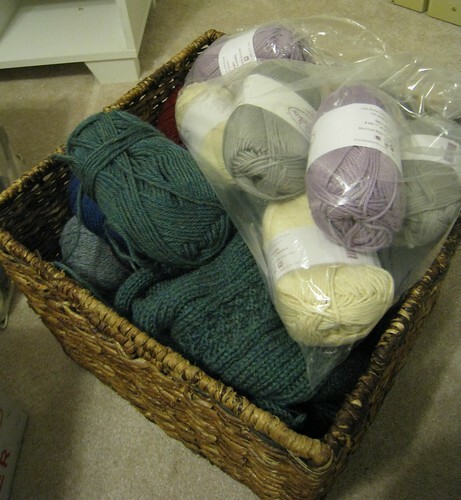 It currently holds about 5 projects, a reasonable quantity, I think. 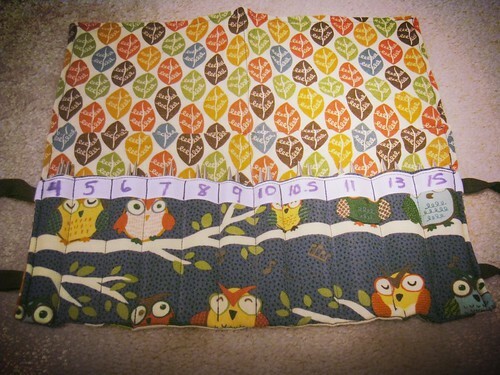 Perhaps the best thing about this exercise was the number of needle tips I reclaimed--almost my whole set! 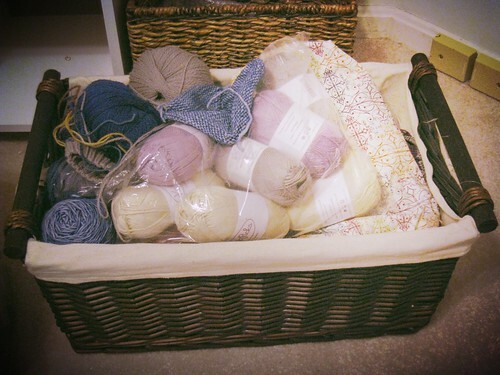 Just waiting to be put to use in even more projects!